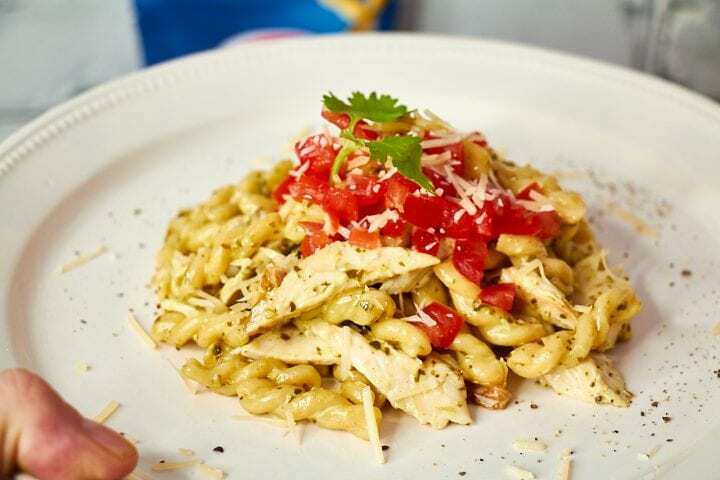 This Easy Chicken Pesto Pasta Recipe post is sponsored by Barilla pasta. Did you know that pasta is an important part of the Mediterranean diet? My husband and I look at pasta like a blank canvas. You can just make it and unleash your creativity with a variety of sauces, proteins and vegetables. We are thrilled to partner with Barilla which stands for the joy of healthy and pleasurable eating. 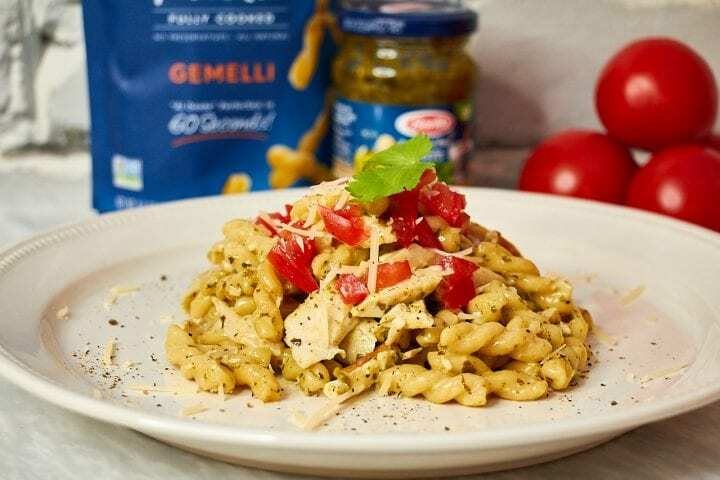 Barilla believes that Italian pasta is the best recipe for good living, as it provides the perfect canvas for a nutritious meal. 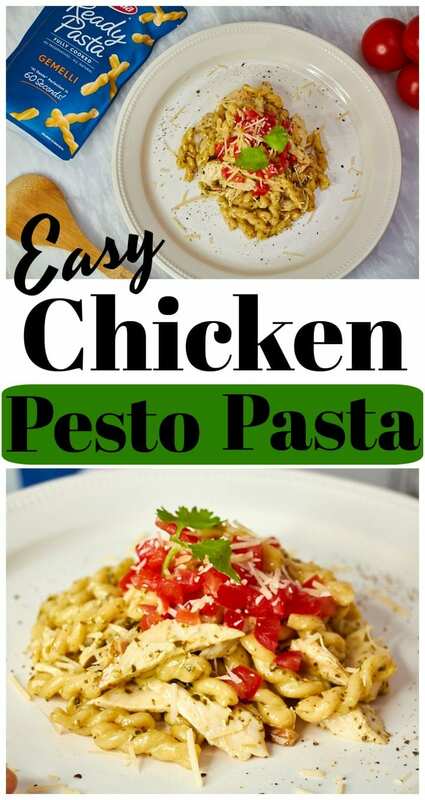 We hope that you love this Easy Chicken Pesto Pasta Recipe. Cook pasta according to directions on bag. While the pasta is cooking, heat the cream and chicken in a saute pan over high heat. When the cream begins to boil, turn down the heat and stir in the pesto. Add the pasta and toss well to coat. Plate the dish and top with tomatoes and Parmesan cheese (option). 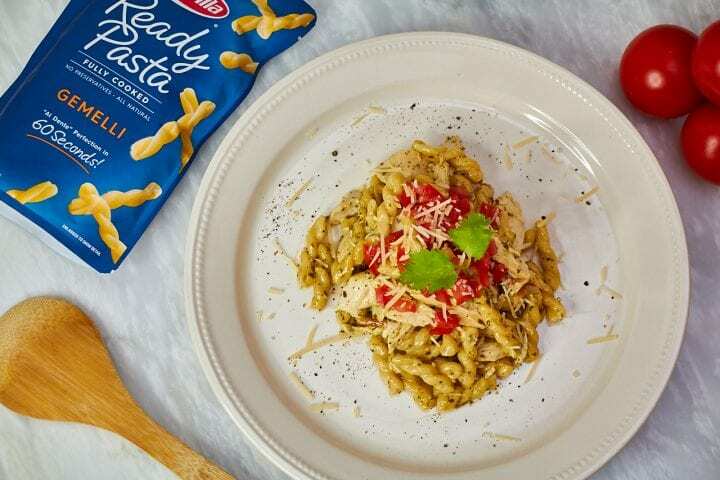 With Barilla Ready Pasta, you are just 60 seconds to perfect pasta with the convenience of fully cooked pasta that is still the quality you expect. Each Barilla Ready Pasta package contains two servings and is made with three simple ingredients, sea salt, olive oil and pasta. Pasta is cooked in the microwave which means in under 1 minute, your snack, meal or side dish is ready! Find it in the pasta aisle at your local Walmart. Let Barilla fuel your love of pasta without spending all that time in the kitchen. With Barilla Ready Pasta, you can celebrate any day, better. We hope that you loved this Easy Chicken Pesto Pasta Recipe. 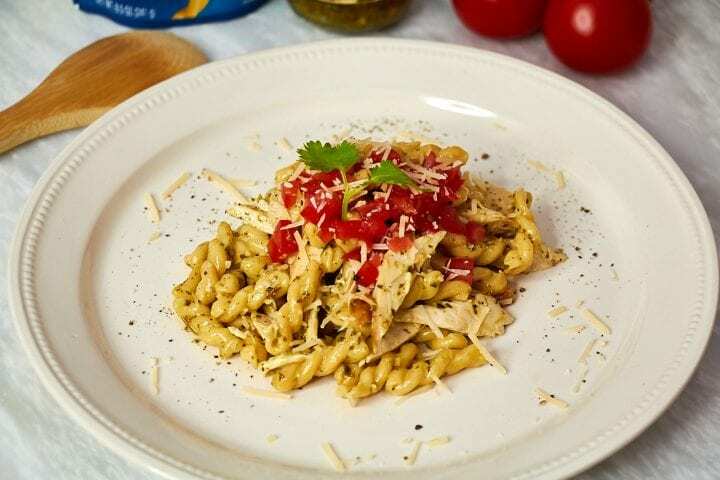 Interested in more inspirational Barilla recipes? Click here to register for their weekly email newsletter. We’ve been making a lot more pasta now that our store is carry some authentic Italian pasta. Totally forgot about using Pesto. Need to hit the store again! Sounds like a tasty recipe! I have not tried these Ready Pasta’s yet. I am going to have to get them for when I do not feel like cooking for a long time in the kitchen. Sounds super convenient! I love Barilla pasta! Their pesto sauce is so good and tastes like my homemade one! SOLD! I LOVE pasta and this looks absolutely amazing! I’m totally checking out their Ready Pasta- I haven’t seen that yet! Oh my gosh! I’m going to have to make this! This looks amazing and I’m a super fan of pesto! Thanks for the idea! I’m pinning it! 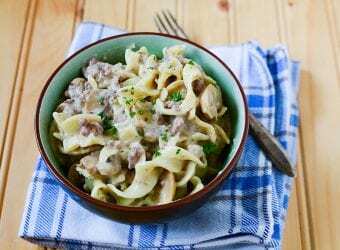 I love a tasty pasta recipe that goes together quickly so busy nights don’t turn into takeout or drive thru. I don’t think I’ve ever used pesto before so I’m curious to see how it tastes. It looks delish! I LOVE pesto! I don’t eat chicken anymore, but I would totally eat this without the chicken! It looks so easy and delicious! I can’t wait to try it! I love pesto, but only order it at restaurants because I’ve never made it at home before. 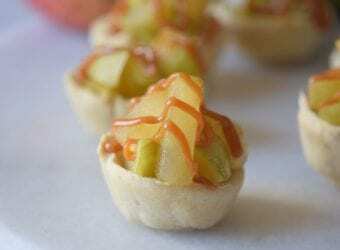 This recipe looks easy to make and delicious. I’m definitely going to try this recipe! Such a delicious and easy to cook recipe. I will definitely try to make this for my family I am sure my husband will like it. Simple dishes like this are a staple in our house. This is perfect for those hectic days when I don’t have a lot of time to prepare an elaborate meal. This dish is right up my alley as we are doing the Mediterranean Diet. I love how easy this is to make. I make chicken several times a week! 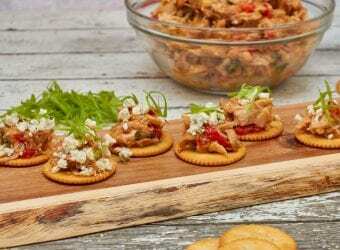 I def need to try this recipe soon, it looks super filling and super yummy!! Oh wow. Looks really easy with few ingredients. My sister likes cooking pasta so I will pass this to her. We eat a lotta pasta in our home. It’s easy to prepare and an excellent go to dish after a long day at work, school and practice. Plus, we love pesto so this is definitely a recipe I’ll bookmark to try. Yummy! I love light recipes, because it’s too tiring for me to cook in the kitchen for a long time. I serve pasta a lot in many different ways but I never make pesto so this recipe is a great change that I hope the kids will like. I will try that pasta too it cooks up so fast. Wow, you really nailed this one. The whole family is sure to love this recipe. I absolutely love pesto recipes! I will try this one as soon as I can make it! I’m obsessed with pesto – this sounds awesome! I love the idea of pasta that is ready to go. Sometimes I have such little time to prepare dinner, especially between activities, and this would be great for busy nights. Wow, this is a really easy chicken pesto pasta recipe. I am going to to have to try to make it next week one night. It looks delicious. I am not a huge pasta fan but I have come to love it since being with my husband. We are a carb-loving family and this looks good! I’ve been in the mood for pasta lately. It really does look easy to make and delicious too! I really love pesto and I’d eat it everyday if I could. I think this recipe looks delightful! I’d love to try and make this at home one of these days. 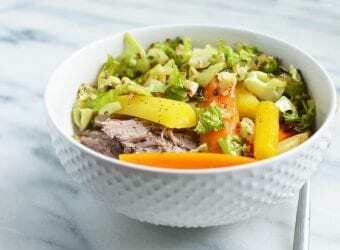 I love this recipe, it’s a dish a would really like and I’m a very picky eater. I’m very busy too so easy is a huge plus, I’ll be trying this on the weekend! I am currently pescatarian but I do love a good pasta dish! I will just have to take the chicken out but this looks great.